Japanese restaurants in Dubai offer a wide array of traditional mouth watering Sushi buffet. If you are in Dubai today, and planned to have Sushi in your lunch or dinner than the city will certainly pamper you with a bounty of choices. Sushi and Sashimi are relatively more famous among the Japanese food. If you are looking for some authentic Japanese restaurants in Dubai or those that specifically serves Sushi only, then there are plenty of restaurants offering Sushi buffet Dubai, that can certainly gratify your cravings for having delicious and traditional Sushi. Dubai welcomes a large number of Asian tourists and residents who have been residing in the city for years or visit annually. The city is overgenerous in pleasing people from any other country by embracing their traditional tastes too. These cuisines are also highly acclaimed by the residents, locals and tourists too. Sushi is one of the food that is equally famous among people from Asia, Europe and other countries. And to serve such needs, There are numerous Sushi Buffet Dubai restaurants that offer a high-quality and a delectable variety of Sushi. 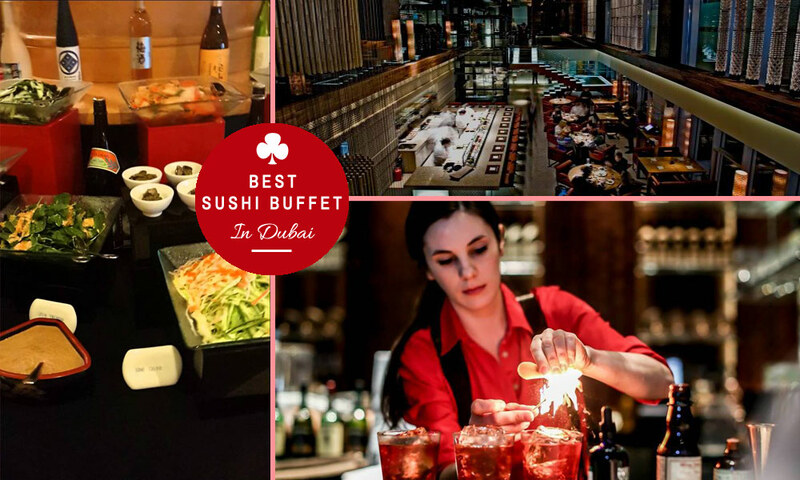 Here stated are the best five Sushi buffet restaurants in Dubai, which offers you the best variety of Sushi in lunch, brunch and dinner, so pick one that clicks you the most. Zuma has a great reputation among the best Japanese restaurants in Dubai. Zuma is unquestionably at the pinnacle of the premium Japanese dining. It is one of the most stylish and serene place that is beautifully crafted by using bamboo, carved wooden structures, notched granite and stones, typical fabricates in Japanese patterns. Zuma offers you an inclusive variety of Sushi, Sashimi and other Japanese food that are simply exceptional. The Zuma experience is an ultimate that won’t let you stay calmly in your seat without applauding their lip-smacking flavors created with a blend of customary Japanese recipes and contemporary conceptions. Zuma is located in the Gate Village 6, Dubai International Financial Centre (DIFC). If you like to enjoy the typical flavor of soft vinegared rice served with some raw seafood, tropical fruits and vegetables in a modern Japanese ambiance, then heads towards the Itsu Sushi Restaurant without thinking of an alternative. Itsu Sushi offers one of the most affordable Sushi buffet in Dubai. The restaurant offers you a considerable variety of Sushi and Sashimi served in traditional Japanese flavors. They served Japanese food over the conveyer belt that offer you to have a variety of food every time. It cost you only AED 89 for a Japanese soup, drinks and all you can eat Sushi, which is actually a great value. Itsu Sushi is located alongside the Marina Walk – Dubai. Norimaki, Uramakizushi, Futomaki or Makizushi, you will get all of them here. Nobu offers an extensive variety of Sushi buffet Dubai. If you like to have fish, rice and nori; all fresh and raw with super sharp forks and knives, then Nobu is your place to be. Nobu is a fusion eatery with a blend of Japanese and western patterns. Furthermore, Nobu is the only place which offers you authentic Japanese garden experience too. It is located in the Atlantis – The Palm, Crescent Road, Dubai. Sushi is a traditional Japanese eatery that is also reflected from its appearance and food. Beautifully designed with plenty of woods, indoor plants and stones, Sushi deliver the superior authenticity of Japan. Sushi has confined the menu to authentic Japanese food and serves you most genuine flavors around the town. It offers delicious Sushi buffet Dubai in their ‘Go-Shumori Sashimi’ feature that serves you 5 different types of sashimi, a serving of miso soup along with steamed rice and soft beverages and it cost you around AED150. You must be thinking that their Sushi buffet menu is limited, yet it is a worthy sign as they deliver just the best. So ‘Sushi’ should be your best option when you want to have authentic Japanese food only. Sushi is located in Grand Hyatt Hotel. Located along the serene beach side, Café O is a decent choice for having delicious yet reasonably priced Japanese food in Dubai. Café O features Sushi, Japanese and Chinese in their menu. The restaurant offers you to enjoy a delectable Sushi buffet in casual dining environment while enjoying the city lights and shoreline panorama of Dubai. It costs you around AED 220 (for 2). Café O gives you great options of Sushi garnishing including wasabi, sauces, ginger pickles and daikon that add great value to the flavors. Café O is located alongside The Walk, Jumeirah Beach Residence. These are some of the best Sushi buffet restaurants in Dubai that offers a wide range of Sushi on their buffet menu. If you want to recommend a restaurant, please do so by adding comments below. You can also checkout restaurants in Dubai offering quality buffet for more information.